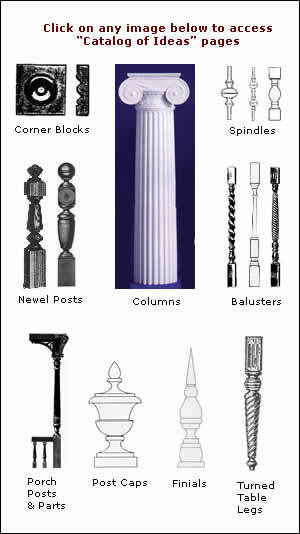 New England Woodturners is a custom woodturning shop producing finials, porch posts, columns and balusters for restoration or for new construction. In business since 1976, our longevity in the craft enables us to specify cost saving strategies for building large or complex woodturnings. We are frequently called upon to manage difficult projects and by coordinating the services of other vendors we insure satisfactioin of the client. Our own production is exclusively in hand-finished wood, but we have devised creative, appropriate solutions incorporating other materials. Disclaimer: All drawings and photos on this web site and displayed in catalog pages are only meant to be representational of products that we are able to supply--- we pride ourselves on custom work. It is very important that you visit our FAQ and Estimate Inquiry Form pages BEFORE calling our shop. Information like quantity desired, dimensions, type of wood, etc. etc. are all critical pieces of information we need to expedite your estimate for custom work!